Cryptococcus neoformans is a fungus that is most commonly responsible for the disease meningoencephalitis, an infection of the central nervous system, and is potentially fatal in immunocompromised individuals such as those with AIDS. In addition, research related to C. neoformans has concluded that melanin production allows the fungus to cause disease and that the transcription factor, BZP4, is associated with this phenotype. This data leads one to question whether BZP4 actually has an influence on the fungus’ ability to cause disease. In order to test this theory, a strain of C. neoformans H99 with BZP4 absent was restored with the BZP4 gene via biolistic transformation and used to inoculate a 30 mice along with the deletion strain and wild type and observed for 42 days for virulence and fungal burden. By the end of the experiment, it is expected that the reconstituted strain and wild type will present the most cell counts in the mice on average compared to the deletion strain. These two strains may also be able to cause disease and kill the mice they infected. Based on previous data, one can predict that the transcription factor, BZP4, is crucial for C. neoformans virulence. My activities have slowed down in the recent couple of days because the lab is starting its mice experiments. All that is required is to grow my cultures out and prepare them into an innoculum for the mice. After that I simply inoculate the mice and watch them for days and record what I see. To be honest, this week has mostly consisted of me trying to get building and ID clearance so I can actually check on the mice for days to come. I have been able to get ID clearance but I’m waiting on going through orientation for the animal facility next week in order to actually observe the mice on my own. I did however innonculate 3 mice on my own, so I am proud of that. I am a little worried in terms of time because I don’t actaully harvest the mice until the week of the poster session. As a result, I will probably be scrambling to collect the data from the dissection. In fact, we dissect on the day I’m supposed to submit my final draft poster for printing. So in short, I’m a little stressed as to how this is going to play out. I’m prepared to at least explain what the results appear so far in the poster. Other than this, my experiments last week were successful for the most part. Although, I did make a mistake last week while doing a PCR. I was so confused when they came out. I didn’t think it was physically possible, but I made it happen. Basically, I screwed the canister that holds the tubes in the machine too tight and they melted. 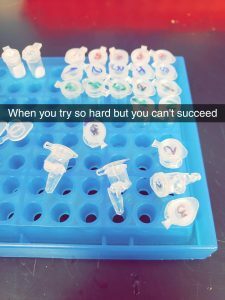 I couldn’t even get the pipette inside some of the tubes. So I had to do some of them over. My work in the Perfect Lab varies from day to day. The day may start with me immediately working because at this point I know what I’m expected to do. Nevertheless, on days where I have no idea what I’m supposed to do, I sit and talk with my mentor, Jenny, about the next experiments I need to complete to finish my construct*. Most days consist of me performing PCR’s on particular segments of gDNA to make the constructs for biolistic transformation. However, every week I learn something new in order to move further in the project. Jenny primarly introduces different techniques and approches to solving problems in experiments. Besides performing PCR’s and gel electrophoresis, I have learned to cut bands out of gels, extract DNA from gels, innoculate microbes, isolate DNA from cells and a plethora of other tips and procedures. I’m usually doing 2-3 of these things in a single day. In addition to this, I have also learned from my mistakes and through those mistakes learned more about myself. For example, I have noticed that around 4 or 5pm, I am more prone to making simple mistakes compared to the beginning of the work day. Nowadays, I avoid performing complicated procedures at that time of the day and simply prepare to do it the next day. In doing this, it forces me to be more congnicent of time and prioritize my responsibilities for the day. Fortunately, I have been able to produce sufficient yeilds with my PCR’s and DNA extractions to be able to transform the C. neoformans fungi. The next couple of weeks will be a little more stressful because my mentor will be leaving and I have to prepare/start mice experiments. The lab that I work in (Perfect Lab) focuses in further understanding fungal Cryptococcus strains and how it utilizes its genes and proteins to function. My project specifically deals in further studying the fungal strain, Cryptococcus neoformans, that causes meningitis in immuno-compromised individuals. The ability to produce melanin in this fungus is an important factor in determining its extent of virulence. Further, I’m working with a transcription factor, BZP4, that was previously found to be associated with the expression of melanin production. The goal of my project is to demonstrate a relationship between the presence or functionality of this transcription in C. Neoformans and virulence within a host via genome deletions, additions and replacements of BZP4. I will speak more in depth during my chalk talk next week. During my interview with Dr. Perfect, we discussed numerous topics related to his education, science/research, medicine, his kids, etc. My most memorable moments in life are the times when I give people the oppurtunity to speak freely and simply tell their story. In school, a guidance counselor told him he could be anything he wanted to be. So he decided to become a doctor. He continued along the pre-med course in his undergradute career and revelled in the complexity and ability to help people as a doctor. Further, he continued to specialize in infectious disease in his mdecial career because he appreciated the simplicity of infectious disease: it normally requires a diagnosis and treatment. He added his conscern that this fact is changing given the surge of antibiotic-resistant bacteria but it has not affected his work immensely (his top world coscerns were also nuclear warfare and global warming). However, he would find himself falling in deep interest in a particular yeast involved in causing meningoencephalitis. On February 14, 1978 at 11pm, Dr. Perfect recieved a severley ill patient infected with Cryptococcus neoformans. At the time, he found the situation very intriguing and decided to study the fungus thoroughly. As a result, his lab and research over the years has contributed to the understanding of meningitus and mycology. Unfortunately, he did have many conscerns about how research is conducted even today. He believes funding for research is minimal and that PhD research and MD research is too polarized. Moreover, he attributes this to the public’s and government’s attitude toward science. People don’t fully understand the importance of the “silly little experiments” that take place in the lab and how they directly affect the people. He proposed one example in relation to molecular biology. Without the establishment of basic molecular biology data and techniques, doctors/scientists would be unable to even identify the cause of an individual illness, let alone treat it. Also in my discussion with him, he gave me advice on considering a medical degree and his personal experiences. Dr. Perfect feels that the field of medicine is a rewarding career and appreciates that he is able to help people everyday. Upon asking him how he deals with a patient he is unable to cure, he said you must first distinguish between sympathy and empathy when in medicine. Essentially, doctors have to learn to only bring empathy to work in order to protect their own mental health. He also added “There will be some deaths but everyone does that.” Hence, you have to accept the fact that you did all you could do and that it was that person’s time. Moreover, Dr.Perfect referred to the AIDS epidemic in the 80’s and know one understood what or how to address AIDS at the time. Consequently, there were several deaths that took place because of this lack of information. What also bothered him was not just that he couldn’t help these vicitms at the time but that these victims were were forced to die alone while disowned from the families because of their sexuality (AIDS epidemic affected gay men predominantly). He advised me to prepare and not worry about how I was to obtain a medical degree but discern whether or not I had a gift for it. Overall, this is a man who can say he influenced the future in a positive manner. He helped buid a field of molecular mycology, help construct antifungals, made friends globally, developed a productive lab that publishes regularly, as well as taught and trained 60-70 students. What I admired most was how he used his position to bridge a connection between medincine and scientific research thus shortening the intellecutal divide between PhD’s and MD’s. He expands his medical degree from simply seeing patients to research and teaching. He was also able put his kids through school and see them develop to influence the world, too. Lastly, he hopes that I develop an excitement in discovery and truly experience what it is like to be in a research project this summer. My core expectation for the summer is to gain a general perspective of how research is conducted. In addition, I would like to at least be exposed to some of the basic experiments and techniques used in molecular biology and possibly master these skills by the end of July. I’m currently working with members of Dr. John D. Perfect’s lab. In general, the lab focuses on various strains of Cryptoccocal neoformans but has several projects taking place simultaneaously. However, the project I’m working on pertains to a transcription factor, BZP4, in C. neoformans that may be associated with the expression of melanin, which is affects a fungu’s extent of virulence. Over this past week, I feel that the lab has and will exceed my expectations for the summer. On day 1, I was being trained to perform gel electrophoresis and patch plates with transformed E.coli. By the end of last week I had been taught to innoculate fungi, perform PCR, precipitate DNA from PCR, clone DNA, conduct biolistic transformation and prepare media for plates. My mentor, Dr. Jennifer Tenor, has taken the time to sit down with me to not only fully explain the project but the general construction of a research project. Such projects start with a question, individual research and then a plan of activities to answer the question. The Perfect lab is very organized and, in my opinion, a “perfect” example of a lab that efficiently contributes to science and medicine. More importantly, I’ve learned how the social atmosphere affects the efficiency of a lab. Each person in the lab has a relationship and there is a general positive energy in the lab everyday. The lab is welcoming and people are almost always willing to help. Moreover, everyone has a technical/intellectual strength that they bring to the lab and that helps forces the project further. My hope now is that I’ll be able to develop such a strength from this summer and be able to carry it into the future.